In the years before and during the French and Indian War, "tensions over dominance in North America flared as British and French cartographers each claimed large, overlapping territories for their respective colonies on the continent." Brown 2015, 7. The results of this cartographic competition include a number of the most remarkable maps in American history, from Guillaume Delisle's landmark 1718 "Carte de la Louisiane et du Cours du Mississipi" on the French side to the iconic 1755 "Map of the British and French Dominions in North America" by the Englishman John Mitchell. Clark 2005, 192-97. See generally Schwartz 1980, 142-164. The Collection includes two dramatically conflicting examples from this famous "war of the maps," both produced in 1754, at the very outset of open war: Emanuel Bowen's "Map of the British American Plantations," ID #2247, and Jean Palairet's, "Carte de l'Amerique Septentrionale 1754," ID #2248. 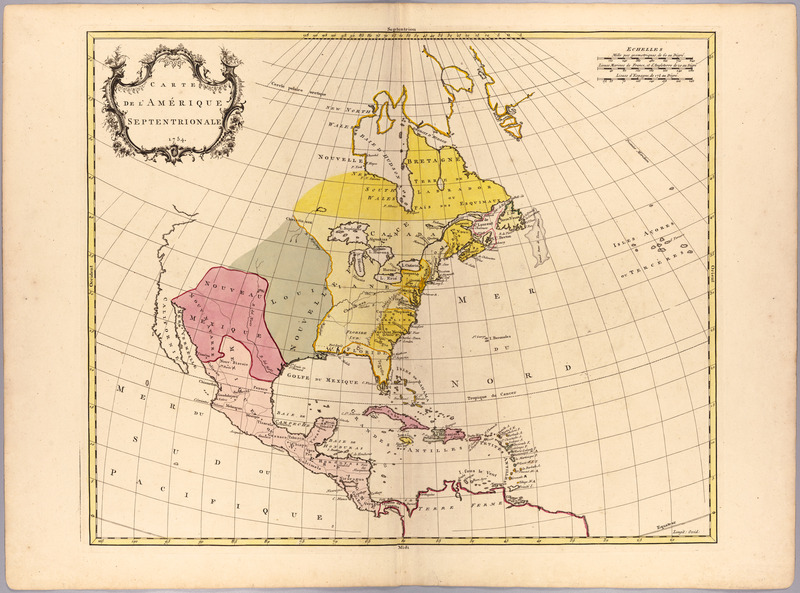 Palairet's map conforms to the French view of North American colonization. The "Possessions Angloises" are narrowly cabined to the east coast, while the entire area west of the Appalachians is "Nouvelle France" and "Louisiane." However, one gets a very different picture upon viewing two other copies of the same Palairet map, the Library of Congress copy (Phillips 1909, 3502, #13) and the Boston Public Library copy. Although these two versions bear the same outlines, title and date (1754), they are quite different from ID #2248: (a) the colors and names of Virginia, North and South Carolina, and Georgia extend all the way west to the Mississippi; (b) the parallels of latitude bounding these colonies extend beyond the Mississippi to the frame of the map; (c) the words "Nouvelle France" have been deleted entirely; and (d) the word "Louisiane" appears in a much smaller font, at a spot just north of New Orleans, rather than spread across the mid-west. These two versions, of course, conform to the British claims as set forth dramatically in the Mitchell map, "The most important map in the history of American cartography" (Schwartz 1980, 159). The discrepancy is almost certainly explained by Palairet's circumstances. Although he was born in France, he had settled in England, where he worked for the royal family as "French and Writing Master" to the children of George II while producing maps. There's no reason to doubt that the version of the map in this collection was made in 1754, the date in its title cartouche. After the Mitchell map was published in February 1755, it seems likely that Palairet felt constrained to change it to conform to the ambitions of his host state (let alone his employer!). If so, the "French version" would have appeared in the earliest printings of his Atlas Methodique, and the "British version" in later printings. Little is known of the printing history of the Atlas Methodique. The Library of Congress copy and all copies of the Atlas in OCLC are dated 1755. So is every copy noted to date in records of auctions and private collections. However, Phillips' catalog entry includes an intriguing, one-sentence, "Note - First published at London in 1754." Phillips 1909, 3502. There is no record of where Phillips got this information, but it is consistent with the explanation above of the differing French and British versions of the map. Palairet, Jean. 1755 (1754?). Atlas Methodique. See Note.